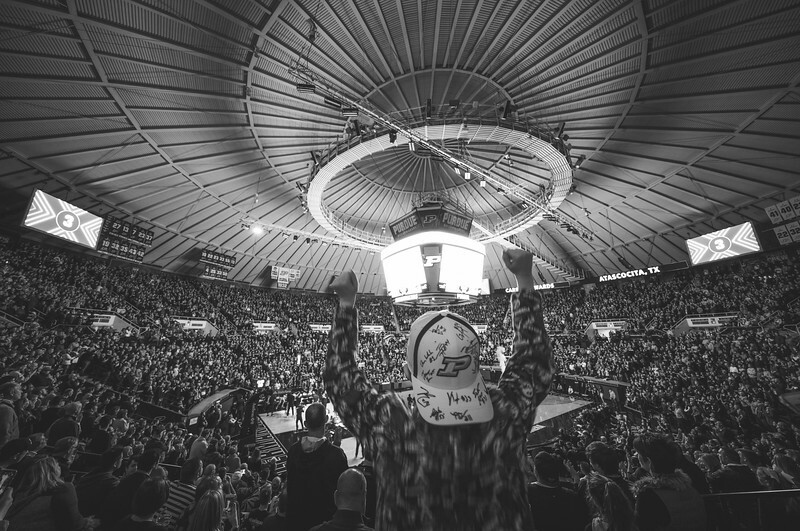 Before the game started the Boilers played a short video and had a moment of silence for Tyler Trent. 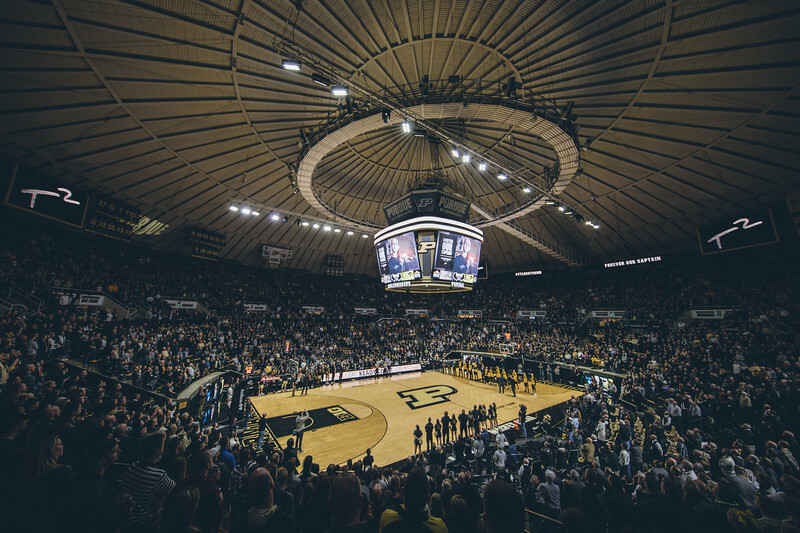 No words that I use on this blog will ever do justice to what he meant to the Purdue community. He was a bright spot in a world that seems headed in the other direction at times. When you open up social media and find hate everywhere you also could find Tyler. He was a special young man that deserves all of the accolades he has been getting these last few days. I wanted to make a photo of the celebration tonight with that in mind. 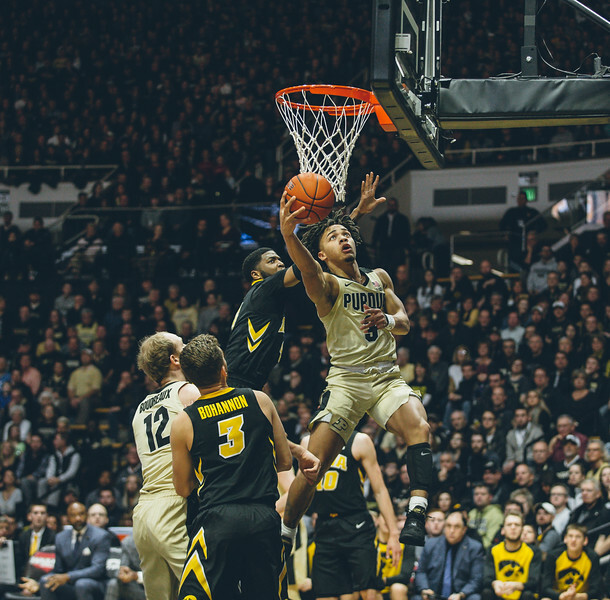 I think the Purdue photographer Charles made a better photo, but I wanted to chip in my little piece. 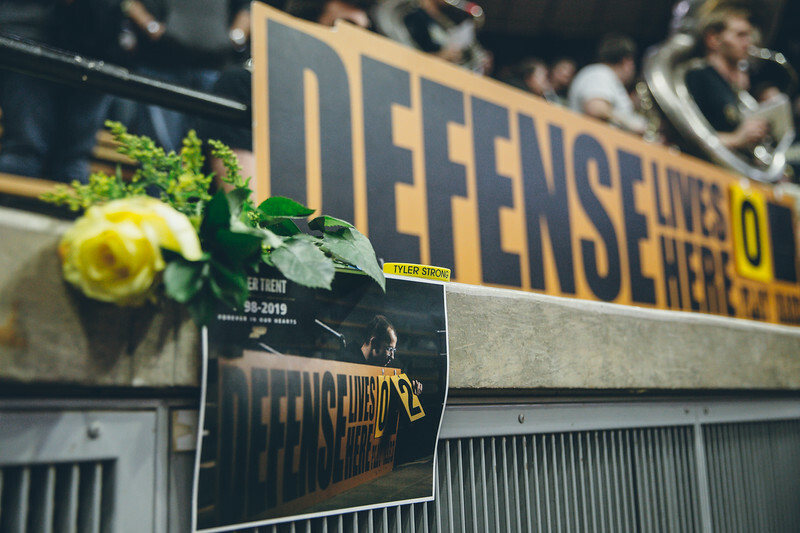 I was strategically placed near the spot where I used to watch games from to get the memorial for Tyler, and I decided to stay there for intros. I was not there to shoot game action so getting back to my seat was not a huge priority for me. As the intros were going on I started seeing a fist show up in my viewfinder. I looked down to see a young man dressed in Purdue garb jumping up and down for each player. Suddenly the photo idea changed. This was the photo. Well after the game I found out that this young man was also named Tyler. He had cancer, but it is now in remission. Sports can be a silly thing at times, but when you see the joy they bring this young man much like they did Tyler you realize that they can be bigger than the game. 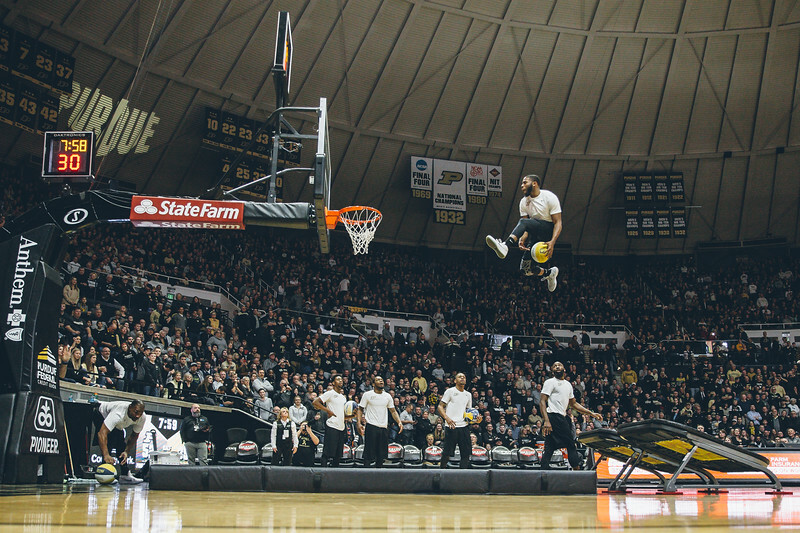 The halftime show was an amazing acrobatic/dunk contest that was super fun to photograph. I was only going to stay for the first half so I was leaving when I realized what was about to go down. This was the chance to make a photo that I have been thinking about for years. I have always wanted a breakaway dunk in the second half so I could make a shot similar to the famous Michael Jordan free throw line dunk shot. I never seem to be in the right place for that though. With many dunks happening during non-gameplay I was able to get closer to the basket and get my camera right on the ground. The result is a fun photo that shows just how high these guys can get. For the past year or so I have been making photos of my #TylerStrong band in various places that I have been lucky enough to visit. Each time I did I would send them to Tyler to let him know that he was there with me. Tonight before the game I took my band off and made a photo of it in front of the Paint Crew. As I was walking away I realized that this would be the first time that I had done this without sending it to him. At some point I did make some game action photos yesterday. As I said above I only shot the first half of the game. I did have some fun although I don’t know that I made anything amazing. It was nice to get some sports shots in during this new year though. When I am compiling all of the year end lists it starts to make me antsy to get out and make some photos. This was a good chance to do just that. The next sporting event on my calendar is over a week away so I would have been going crazy by then.